/ Modified dec 22, 2017 10 a.m.
Julie Luchetta, left, and Karl Blade work with provide outreach services for young homeless people in Tucson. It's a Thursday afternoon, and case managers Karl Blade and Julie Luchetta get ready to hit the streets of Tucson. They both work with Our Family Services, a local nonprofit that forms part of a national effort called Street Outreach, which helps homeless youth. They, along with one other case manager, are the only line of communication between homeless youth out in the streets and the resources available at Street Outreach. As they head down Speedway Boulevard, Blade explains all the hot spots they will hit on our tour. "Fourth Avenue, downtown area and especially the Ronstadt Center — that's kind of like the major hub, and that's where most of the kids congregate," Blade said. Tucson and 10 other cities received $200,000 grants as areas with high populations of homeless youth, Blade said. Blade explains how he uses the clipboard to record contacts. He notes the age, gender, race, ethnicity of an individual. He also records whether or not they were given a Street Outreach kit and whether or not it's a first-time contact. Anyone under 24 years old is eligible for services like the hygiene kits, food, water and, more importantly, housing. Each food pack contains spaghetti, crackers, nuts, a fruit cup and a Safe Place card. Safe Place cards let homeless youth know that QuikTrip convenience stores around Southern Arizona serve as places they can go to seek shelter. As Blade and Luchetta walk down Fourth Avenue, it is quickly apparent that their outreach involves even students from Tucson High School. When Blade begins to tell the group about the services, one girl mentions having a Safe Place card already. "We are Street Outreach workers, so we work with individuals that are considered homeless or at risk of being homeless," Blade said. "So we are just passing out information." Another girl in the group asks what the program does. Blade tells her about services offering food, housing, transportation and basic needs, and reminds her to pass on the information to anyone she might know who could potentially be homeless. Before the Street Outreach program, Blade worked as a school-based case manager. It had become clear to him that a large number of the young people didn't have to be out of school or on the streets to be considered homeless. "We would go into the different high schools, and with the help of the teachers or the staff at the school, they would help us identify kids that were homeless or at risk and we would take care of everything right there at the school," Blade said. 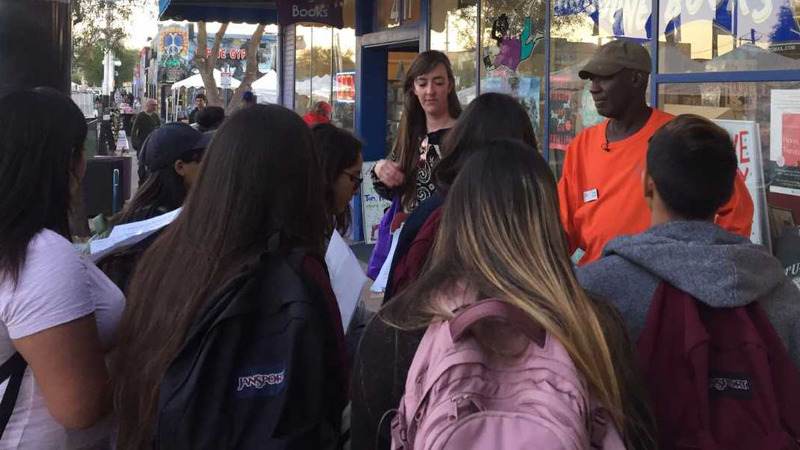 Two social workers from Our Family Services inform a group of students on Fourth Avenue about the Street Outreach program. Our Family Services lost the funding for that program, and that led them to seek the grant that connected them with Street Outreach. Communication with homeless youth for Blade and the team had to be made on the streets from then on. When Blade spots a group sitting at the south end of Fourth Avenue near the bridge, he finds out one of the girls is hopping between the couches of friends. When he finds out she is only 18, he tells her she qualifies for services like housing to allow her to going couch to couch. Blade then hands her the information card and tells her to set up an assessment interview to get the process started. "We just ask basic information about education, completed school, family history and what it is they feel they need help with," Blade said. Julie Luchetta, his partner, spots a younger person in the group. "She's talking to him about setting up a time to come in a get that process started," Blade told me. The process is only the beginning of the long journey many of these young people take to get back on track. Blade says that is the most challenging part of the entire process. "We set a goal for them, and just before they reach the goal, something happens and 'BOOM.' [They] fall off the cliff and start all over again," he said. "For some of them, when they are ready and want to receive services, that's when they'll pull us aside and set up a time." Blade and his crew head out on foot three to five times a week during the afternoon hours. Starting in January, they plan to have two late nights a month traveling a van to check on the hot spots teens tend to head to during the night hours. 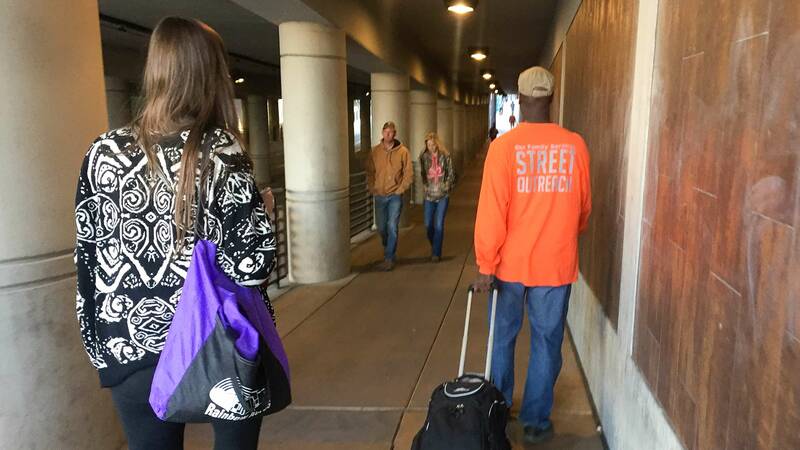 Last year, Street Outreach connected with nearly 1,700 homeless youth. Of that total, 165 were provided with case management services.